This morning we had some rain! Two all-too-brief periods, but rain nevertheless, hardly enough for the plants, and now it's sunny and blowing, so gone before we knew it, but it's amazing what they did to the mind. I'm so optimistic now, I am looking forward to gardening in the cooler season, (and plenty of prep weeding/clearing prior,) and have even started thinking of practicing sewing to improve my skills. I'm thinking of making a series of small bags using cotton scraps to practice such things as sewing straight, buttonholes, and zippers. Then I'll move on to a few more house pants, a couple of longer PJ bottoms for Ben and a few of different length for moi, but paying closer attention to the sewing. While digging up pants patterns, I came across a vest pattern I took directly off of one of Mom's made with handwoven fabric from somewhere in East Asia. I was secretly hoping to adopt the vest after Mom tired of it, but wasn't fast enough and it was gone in a couple of seasons. I wished I had a photo of the garment for reference. It was probably in Japanese-medium-ish, (skinny, or other-East-Asian-medium, which is skinnier,) and it might have had a pocket which I didn't bother with. After I decipher my codes, (I didn't trace two garments, I remember reworking the one; who knows what I intended!) if I try making one, I'll show you more. For decades Mom talked about colors in weaving and how she'd like to learn/manage/control them in her work; she introduced me to the name Itten in the early 90's. So as an obliging daughter that I am, (even though I was completely and happily in the structure camp then,) I studied it myself enough to know how to talk about color wheels, relationships, values, saturations, simultaneous contrast, and the like. I even made up a exercise sketchbook she can play around with hues of her choice, and we continued to discuss it over Skype. When she brought up the subject again in October, it suddenly dawned on me there are topics she loves to rehash, how she'd like to master them, while not really meaning it. So in the interest of saving us both a lot of time and, on my part a lot of grief from having to repeat the same discussions, I asked if her wish was genuine, and she said no. So that took care of that. On my part, I do keep harping on a few things without making any efforts, but I am a tad younger than Mom and do hope to get to them eventually. Even if cursory. Instead Mom wanted to be able to see images she's collected, so we strung pieces of fishing line the length of her dining and living rooms and I got a few postcards to get started, and also asked the rest of the family to send her colorful stuff. I had an inkling I love/need my me/quiet time more than I realize and this turned out to be so true. I managed some while at Mom's but not anywhere near enough, and while travelling South, I got so out of practice, even when I could have drawn, (and I bought a selection, including LJs that needed to be sent forward,) I gazed at the telly. So now I know I need it; it's part of my brain/mind makeup, but it's not quite part of my routine; I have made up some of it since we've been home, but it still feels slightly foreign. I wonder if I need to read up on the matter. Which leads me to something I've felt particularly keenly since my Auckland trip in April; there I had a basic accommodation with everything I needed but nothing I didn't, (no internet but a telly/Al Jazeera the day the US bombed Syria,) and staying there alone gave me a lot of headspace to think and not think and work. Which made me feel I was living "deeply", shall I say? While in Auckland I didn't go to all/many interesting art/book/craft places but returned to Auckland Art Gallery time and again. (At the time it was a hard choice as Auckland War Memorial has a solid Pacific collection and a small but touching Holocaust room, both of which I love.) But in retrospect it was so the right thing to do. I like being the person who needs fewer inspirations but can consider/work with the few in some depth/originality, undistracted, and this was was hard in Japan/Dunedin/Wellington as FOMO, (that's "fear of missing out", Mom!) was hard to beat. When travelling with someone else, there is the balance to consider, too. But requiring fewer conforms to my idea of someone who makes things, while serially going to exhibitions can be me turning into a mere consumer. Hard to tell, as exhibitions' value/effect on me become evident in retrospect, and sometimes years later. This ties back to accommodations. With fewer belongings/choices, life allows me to concentrate on the doing, leading to more meaningful/satisfying inner life. Of course we can't live permanently with a subset of belongings as we do while travelling, (or can we??) but I/we can do with a whole lot less. I was doing well with books until Volume emerged a year ago and I've become interested in Richard Ford, (who must be read and not listened to unless he is reading.) I have become more discerning, not buying something just because I visit a place or skipping shops altogether because I know I don't need anything at the moment. (Art supplies!) I even got quite overwhelmed with choices in Japan I had to do neighbourhood stationary and book places in small doses. I say I am making progress but not fast enough to please myself. Except Ben said if one makes things, we do need material/tools/options, option being a big one for small town folks like me. So there is that. Wellington used to be a treat; we had mapped out nine of our favorite book places and used to stroll from one end of the CBD to the other, or Parliament/Lambton Quay to Willis, and moved on to another section of town, Cuba St, maybe even to Courtney. And that's not counting gallery shops' book sections. Today I can only name eight in the CBD, and fortnight ago we found two remaining and went to one, plus three used on Cuba. Most of the demise are blamed on the Internet, although a couple had to do with retirement from memory. In the past I bought a bit from Amazon US/UK but postage became outrageous I quit; I still shop from Amazon in Japan before/when I'm there but mostly used. I also occasionally shop at Book Depository UK. For used books and old exhibition catalogues, (especially old exhibition catalogues,) there is none better than Book Depository. And for the foreseeable future I can't give up Audible, but am perfectly happy to switch if a better/ethical alternative pops up. But if you expected me to complain, you'd be wrong. Volume is tiny, but every single book they have is interesting, so you can easily pick up a few and browse for an hour or two and if you engage in a discussion with Stella or Thomas, well, there goes another half an hour, easy. This has decreased our FOMO and compulsion to visit less attractive bookstores remarkable, and also the need to buy and lug heavy stuff, as Volume can so easily order if they haven't got it already. And this last part is what got me completely floored; we spent quite a bit of time at Unity in Welly, (the only remaining worthy new book bookstore we know of,) and there were a few I was interested in but I planned to ask Volume, and when we returned, they had them all. Even some books I read about on Paris Review, LRB or New York Review of Books, or hear about on NPR are sometimes already there if not coming soon. So, yeah, larger new book bookstores in larger cities have become less shiny, and I can't find the right words to describe what a gift this little bookstore in Nelson is, because, you all know, books aren't just things; they are ideas and teachers and entertainment and virtual travel and potential life changers; good booksellers are better than therapists. We are so very, very lucky. Ben and I won't stop visiting used book bookstores. One can't beat time spent in dusty, cavernous and slightly dangerous used bookstores; it's time/space travel, not shopping. I regret not picking up a Colm Toibin I've been after but just couldn't be bothered carrying that day in Welly; it does make the memory of time in that particular shop unforgettable, though. This is from Slightly Foxed in Oamaru. 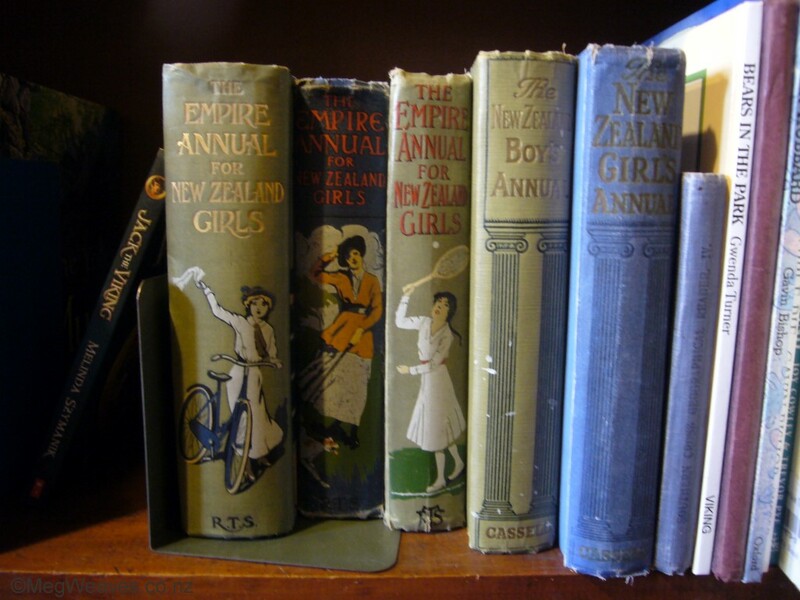 If you like old books and find yourself in Oamaru, don't forget the antique stores. Something we noticed while travelling in the South was the development of lovely cafe-style food in smaller places with high concentration of visitors; we found Twizel and Oamaru particularly pleasing in this respect, while Dunedin, Christchurch and even some in Wellington appeared stuck in the 90's/2000's. We don't go to tourist towns, bypassing Wanaka and Queenstown this trip for e.g, but it would have been interesting research; we just can't cope with the traffic and parking. I'm trying to think of where Nelson stands. We did walk around Arrowtown at lunch time, and it was murderously crowded we escaped with only coffee and... ummm... a custard square. We're nearing the first anniversary of reducing carbohydrate, which worked for both of us, I might add. I did fine in Japan but in South it was devastatingly difficult, faced with scrumptious baking in Dunedin in particular. (Otago Museum Cafe; if you ever go to Dunedin, have a wee carbo blitz there, unless you're celiac, of course.) We've been trying to get back on our horses, but I especially have had irresistible hunkering for sugar and baking. Must. Remedy. Now. We've been reconnecting with a few friends, which as been wonderful. JB and Ali are back in town and we're already met once at the Vietnamese restaurant before Christmas; fingers crossed, more to come. That sewing entered my mind at all has a lot to do with the prospect of seeing more of Maria. We've also been to Rosie's house twice in one week, talking and laughing and discussing a lot of things I'm interested in: art/the art world, the environment, and healthy eating. And some gardening. Rosie has a windchime very similar to one Mom had in the old house; they are made of different lengths of metal pipes hanging from a piece of wood, usually circular, with a wooden disk hanging in the middle, and another piece of flat, decorative wood tied to the disc to catch the wind. As the last piece dances gently, (or not depending on the wind,) the disk hits the pipes, making soothing, almost church-bell like sounds. These were sold all over in the 90's but by the time we started looking for one for ourselves, they were gone. Mom managed to snag one with particular pleasing low pitched sounds, and on seeing Rosie's, in the same forest-green, I realised Mom's thrown out hers when she left the house. I should have pinched it; I never found another with the same low pitch. I wonder if Ben and I can make one. Enjoyed reading all your thoughts. Make sure your establish your own space for solitude. For me and several gals I know the hardest thing was having husband retire and around aaalll the time. We makers do collect a lot of "stuff". I consider it the equivalent to an artists pallet. I was able to make granddaughter a fairy doll for Christmas and only needed to buy in more stuffing. Even had hat wire to stiffen the wings! A very Happy New Year Meg. Thank you, Dianne. Ben's pretty good re. not requiring too much of my attention and vice versa. But why on earth did you have hat wire in the first place?? You have a great start to 2018, too.